Antenna height above sea level is 78 - 91m or 255 - 298 feet. 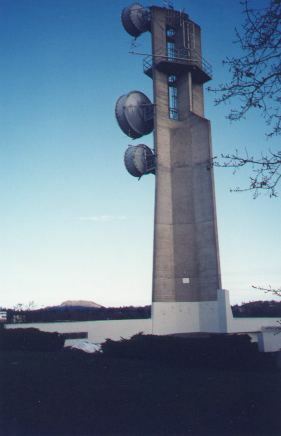 The photo above is the antenna tower which holds the corner array antenna that is pointed in a northerly direction. Due to our close proximity to the United States and in an attempt to prevent interference with our counterparts in the Pacific Northwest, this was the best possible arrangement. The corner array is mounted on the dish side of this concrete structure. The concrete helped to prevent our signal from being heard south of Victoria. The Scala CL-400 Log Periodic array enclosed in a radome aimed at Duncan in the North is also mounted here. The drop antenna is a SRL210-C2 commercial array. All equipment is placed into a standard 19 inch rack. At the top of the rack you can see the bottom of the UHF duplexers. Below the duplexers is a Bell-202 external modem. This is used to regenerate the incoming digital signals to the correct output levels. This ensures that even weak or slightly off frequency signals will be transmitted at their optimum range allowing every receiving station to hear the best possible digital signal. 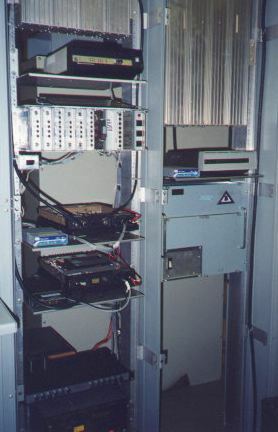 Below the Bell-202 modem is the rack containing the power distribution panel, level control panels, fuse panel, and DTMF control panel. This is where the audio signals are controlled for level. Since each site can be controlled by remote radio in the event of equipment failure, a DTMF board is installed. This allows us to turn off any radio or TNC (modem) and reset the equipment. Below the distribution rack is a Harris UHF radio and Tiny 2 TNC. This used to be the UHF drop repeater. The next rack down shows a Harris radio also with a Spirit 2 TNC. This is the backbone or trunk radio link. The lowest shelf contains the 40 amp power supply. This power supply is connected into the site's emergency backup generator and will be supplied with continuous AC power. This site is also seismically hardened to survive most earthquakes.